The Rhode School of Cuisine offers luxury vacations to the gourmet traveller at our Moroccan and Italian cooking schools. 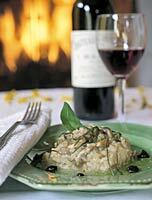 Indulge your passion for food, wine and culture in beautiful surroundings and in stunning locations. At the Rhode School of Cuisine, guests not only learn to prepare, cook and present fascinating traditional and new dishes, but also have the opportunity to explore the history and culture of the country they have chosen. Our Italian cooking school in Europe is based in a fabulous luxury villa in Tuscany and our Moroccan cooking school in our superb Dar Liqama palazzo in exotic Marrakech. Our latest addition is at the beautiful Hambledon House mansion in Surrey, half an hour south of London. Whichever you choose, we offer guests the opportunity to participate in our week-long cooking courses or to just relax and enjoy the surroundings and excursions as a non-cooking guest. Either way it’s an experience you'll never forget. We use cuisine as a way to introduce you to the rich cultures of the country you are visiting. Weekly schedules feature frequent cultural excursions such as guided tours of Lucca and Florence in Italy and exploring the bustling souks of Marrakech. Each of our cooking schools offers a wealth of cultural experiences. The combination of luxurious hospitality, fine food and wine, and an enthusiastic staff are necessary ingredients for, “one of the best vacations we have ever had,” as many of our recent clients tell us. Enjoy your visit to our website and we hope to see you at one of our Moroccan or Italian cooking schools soon.